Lawrence S. Bacow spoke for the first time as University President-elect on Feb. 11, 2018. 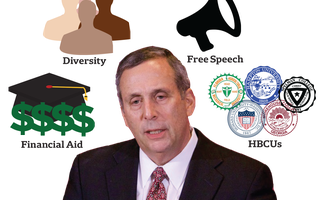 UPDATED: February 13, 2018 at 7:01 p.m.
Sunday’s announcement that Lawrence S. Bacow will serve as Harvard’s 29th president surprised and disappointed some College students who had hoped a person of color would take the University’s top job. 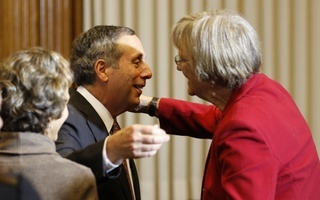 The search committee’s selection of Bacow marks the 28th white male to sit in the president’s Massachusetts Hall corner office. Over the course of the seven month-long presidential search, some alumni affinity groups requested Harvard’s search committee consider candidates from a diverse set of backgrounds; several undergraduates also said they thought the next president should be a person of color. In the wake of Bacow’s debut as president-elect, several Harvard students critiqued the committee’s choice, sometimes turning to social media to express frustration with a pick they said too closely resembles presidents past. “I think the one sort of thing I had in mind for the new president was that it would be a person of color, so it was really disheartening that that occurred,” Sebastian A. Reyes ’19 said. “A thought that I had earlier was that, in a few years, if the diversity of the incoming class keeps increasing, [a] white president will no longer be representative of the Harvard student body, which is a big issue,” Diego Navarrete ’21 added. The selection of Bacow comes at a time when the College is growing increasingly diverse: Among the admitted Class of 2021, more than half of students identified as non-white. Bacow also arrives at the presidency as some undergraduates are pushing for a wide array of initiatives meant to improve Harvard’s diversity. Over the past few years, students have advocated for a campus multicultural center and an ethnic studies concentration. Some undergraduates said that, by choosing a president of color, the University would have signalled it takes these issues very seriously. Nicholas P. Whittaker ’19, a representative for the Undergraduate Council who chairs the body’s Multicultural Center Coalition, said they would have been encouraged to see Harvard choose a president from a marginalized background. “It would've been really encouraging for the University to choose someone who had a proven track record of consistently showing up for marginalized communities, not in just in words but in actions,” Whittaker said. At a press conference Sunday, Bacow said he is committed to promoting diversity at Harvard. “We need to look for the very best and, during my time at Tufts, I’m proud of the record of bringing women and minorities and people of color into the senior leadership, into the faculty, and also into the student body, and I hope to do the same thing here,” he added. Bacow served as president of Tufts from 2001 to 2011. At the press conference, he said he spent much of that time working “very, very hard” to make Tufts more diverse. 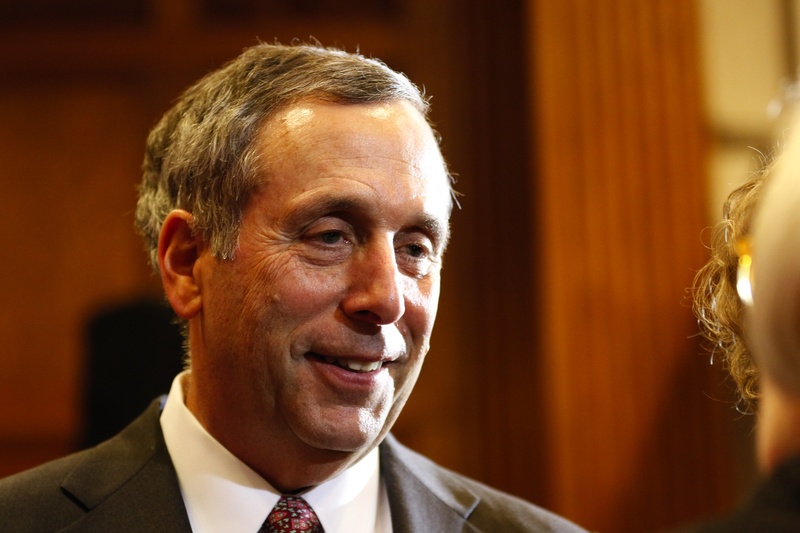 William F. Lee ’72, senior fellow of the Corporation and the chair of the presidential search committee, said Sunday he thinks Bacow’s record at Tufts proves he is a champion for inclusivity. “He embraced diversity as a cornerstone,” Lee said Sunday. In the past three years, Tufts has drawn headlines for its lack of diversity in both its student body and its faculty. Just 4 percent of the Tufts Class of 2021 identify as African American, 9 percent as Hispanic, and 13 percent as Asian American. By comparison, 14.6 percent of students in Harvard’s Class of 2021 identify as African-American, 22.2 percent as Asian American, and 11.6 percent as Hispanic or Latino. Despite some disappointment with the University’s final choice, undergraduates said they are cautiously optimistic Bacow will prove strongly committed to advancing diversity once he takes office. Whittaker also said they hope Bacow advocates on behalf of students of color, especially as the demographics of Harvard’s student body likely continue to become more diverse. “I'll certainly be holding him accountable to do that,” Whittaker added. Other students said they worry Bacow’s selection means Harvard is now trailing its peers in terms of diversity in senior leadership. University President Drew G. Faust—Bacow’s predecessor—was the first woman to hold Harvard’s highest office when she assumed the job in 2007. Brown University appointed Ruth J.S. Simmons, its first African American woman president, in 2001. Dartmouth College appointed Jim Yong Kim, the first Asian American to ever serve as president of an Ivy League, in 2009. “I think it puts Harvard behind a lot of other universities which have already selected people of color as their presidents,” Reyes said. At a time when the average university president in the United States is a 62-year-old married white male with a doctorate, Harvard could have stood out as an exception. In keeping with his immigrant roots, Harvard’s next president has shown his passion for diversity throughout his life. During these crucial moments in Harvard’s history, we require a practical administrator more than an accomplished academic.